During winter break, Chicago was hard at work with a demanding schedule. Coming away with two wins and two losses, the Maroons will start this quarter at 3–8 overall. On December 16, the Maroons lost 59–56 on the road against Loras College. The game was close all the way to the end, with Chicago only down by one point with nine seconds left on the clock, but two free throws put the Duhawks over the edge and sealed the game. Nevertheless, the contest saw several Chicago players turn in strong performances. Second-year guard Morgan Donovan enjoyed a particularly strong game, scoring a career-high 22 points—an effort that earned her UAA Athlete of the Week honors. 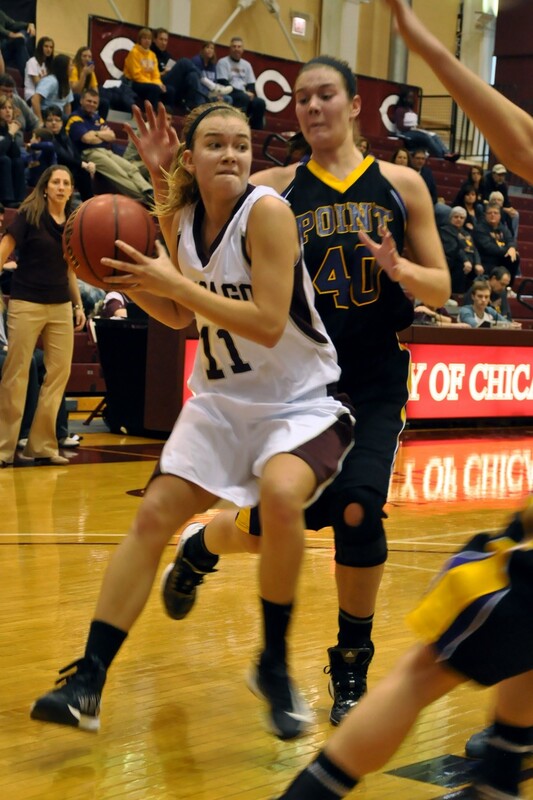 On the 18th, the Maroons beat Saint Mary’s at home in a decisive 79–59 victory. Controlling the paint and out-rebounding the competition 50–39 proved key to helping Chicago snap its seven-game losing streak. The Maroons continued their winning streak against Mount St. Joseph on the 30th, defeating the Lions 80–52. Once again, Chicago relied on its post play for the win, especially from second year Ellie Greiner, who finished with 14 points, eight rebounds, and four blocks. In addition, the team’s 80 points, 28-point margin of victory, and 22 made free throws all marked season highs for Chicago. But on January 5, in its first game of 2013, Chicago came up short against #3 Wash U. The Maroons struggled from the beginning after falling behind 12–2 to the Bears, and eventually lost the contest 96–67. The South Siders will have a chance to prove themselves in their next game tonight at 6 p.m. ET at Rochester. The Yellowjackets (8–4) are coming off a close, double-overtime loss to Emory. Last season the Maroons bested the Yellowjackets easily in their two UAA meetings by a combined margin of 29 points. Looking toward Friday’s game, the team is going to have to focus on defense and starting strong. On average, Rochester is outscoring its opponents in the first half and winning by a margin of almost 12 points. Knoche anticipates a familiar game pace though. Two days later, on Sunday the 13th, the Maroons are scheduled to face #17 Emory. The Eagles are currently at 11–1 and have the best preseason and season record in the UAA. However, Knoche doesn’t expect her team to shy away from the challenge.